The Saltire flies atop a government building at Whitehall in London on Wednesday. British Prime Minister David Cameron was in Scotland on Wednesday to deliver a message to voters: “We want you to stay.” With just days left ahead of a Sept. 18 referendum on whether Scotland should become independent, leaders of all three of the U.K.’s main political parties were headed north in an attempt to keep Scotland part of the union. 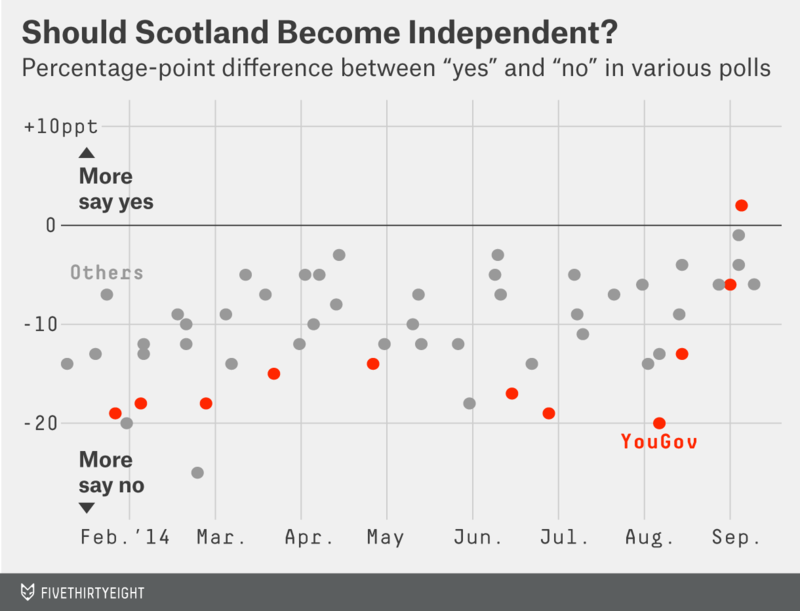 Recent polls have showed a tightening between “no” and “yes.” On average, between January and Aug. 25 (when a debate on independence was televised), the “no” vote has led by 11 percentage points. 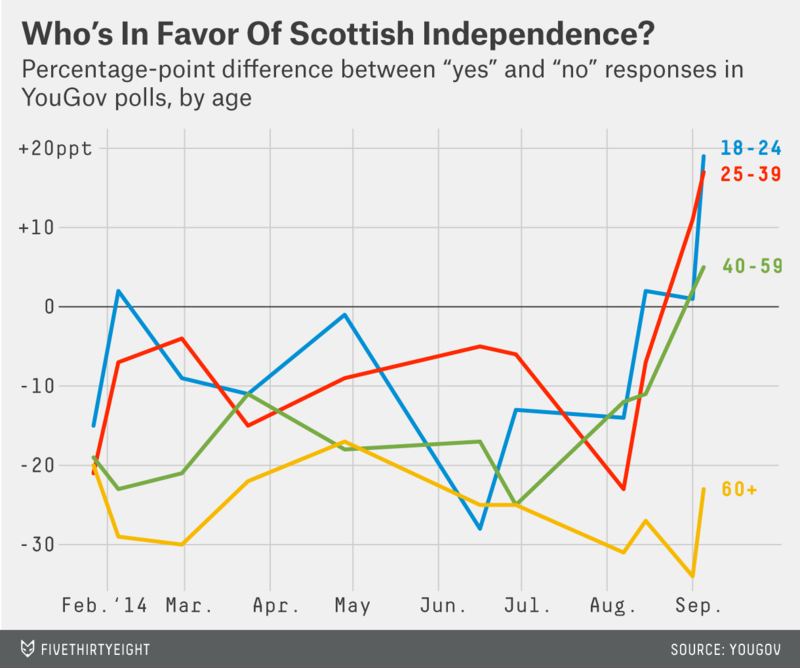 In the six major polls since then, “no” has been ahead by just 4 points. But speeches won’t make any difference to the thousands of people who have voted by mail in the past two weeks. Those “postal ballot” voters have often been neglected in the news media coverage describing the “surge,” the “dramatic swing” or the “rapid shift” toward a “yes” vote for independence. Mail-in ballots were sent to voters starting Aug. 26. Alex Salmond, first minister of Scotland and leader of the independence campaign, has claimed that “hundreds of thousands” of ballots have been returned. Anthony Wells, associate director of the political team at YouGov, a polling company, also said that most of those who say they are registered to vote by mail say they have already done so. In a phone interview, Wells estimated that between 10 and 20 percent of the individuals in the firm’s most recent poll said they had already cast their votes, even though they have until 10 p.m. Sept. 18 to do so. Those opinions are in the bank, so it’s worth considering just how many percentage points they represent in the polls. The most recent numbers show that there were 680,235 people registered to vote by mail in mid-August — they represent about 16 percent of the 4.2 million registered voters who can cast a ballot in the referendum. The number of postal voters has risen considerably though: It’s up 20 percent since March and may have since risen further because voters had until Sept. 3 to register to vote by mail. Postal voters are not just a considerable chunk of the electorate, they are also more likely to cast their votes. In the 2010 U.K. general election, 83.2 percent of those with a postal ballot returned it, while 62.6 percent of those required to vote in person went to the polls. The British Electoral Commission says that difference in turnout holds for local elections as well as national ones. YouGov polls have been influential in the discussion of the tightening race between “yes” and “no.” Its most recent results, published Sept. 6 (from responses collected from Sept. 2 to 5) broke away from previous polls and put the “yes” vote ahead by 2 points, grabbing headlines in the process. YouGov asks respondents whether they have already voted. If someone who is subsequently re-interviewed changes his mind, YouGov attempts to spot the discrepancy and factor it into its analysis (about 50 percent of all respondents have answered an earlier poll). But YouGov can’t tell us how those respondents who claim to have voted by mail say they voted. British electoral law precludes polling companies from publishing a breakdown of that subset of respondents — doing so would constitute an exit poll ahead of the last voting day. To speculate about what’s written on the ballots that have been submitted, we can look at demographics. Wells explained that postal voting tends to be more prevalent among those 60 and older. Again, information from the British Electoral Commission would seem to back up that assertion. In a report on the most recent U.K. general election, researchers compared the share of postal votes with voter demographics in England and Wales and found a positive correlation with those 65 and older (+0.32) and a negative correlation with those ages 18 to 24 (-0.26). In other words, areas with more postal voters were likely to also be places with more older people. That matters because polls suggest that older voters are more likely to vote or have voted against Scottish independence, and less likely to have changed their minds about it. In eight of the 11 polls YouGov has published on the topic this year, those 60 and older have been the most opposed to independence. And while younger groups have generally shifted toward “yes,” older respondents have generally stayed put. While public opinion may be shifting, many of the votes already cast are more likely to favor Scotland remaining part of the union. Carl Bialik and Andrew Flowers contributed to this report.